In a small sauce pan, boil the chicken stock at medium heat. Add a small amount of vegetables (zucchini, cauliflower, turnips & carrots) to cook separately for garnish. Cook all the greens in the stock as well. Keep them on a plate and set aside. Also set aside the chicken stock. In a stew pot, heat 1 tablespoon extra virgin olive oil at medium heat. Add onion and garlic and saute for 5 minutes until soft. Add chicken thighs and saute until the color turns white - about 2 minutes. Add the rest of the vegetables in the pot and stir well. Pour the chicken stock and simmer until the chicken and vegetables are cooked for about 10 minutes. Meanwhile, make a bechamel (white) sauce. In a medium sauce pan, melt butter and then add flour. Stir well with a whisk and cook for about 2 minutes. Pour warm milk and whisk well until they are combined and become a thick, creamy sauce. Add the cream cheese and stir until combined. Add a pinch of nutmeg and stir well. Add the bechamel sauce in the stew pot and combine well. Add frozen peas and corn and cook for 5 more minutes until the stew is thickened. Add most of the greens at the end but keep some for a garnish. 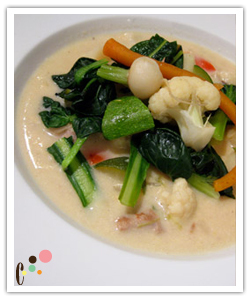 Plate the stew in a shallow bowl and garnish with separately cooked vegetables.